Since Marvel reclaimed Star Wars, there hasn’t been a weak spot. Filling in gaps between movies and TV shows, writer Kieron Gillen has consistently shined a light in corners you wouldn’t expect, and between his work on Darth Vader and the ongoing main title, he’s done a more satisfying, less divisive job with that galaxy far, far away than the movies have — even when you know where it’s all going to end up because of the movies. So it’s been over four years, and Star Wars makes issue #50. It’s going to be big. It’s going to be explosive. It’s going to be good. After building their forces in complete secrecy, the Rebel Fleet is finally ready. But how long will they be able to stay hidden from the dark clutches of the Empire – and Darth Vader himself? Star Wars fans won’t want to miss series writer Kieron Gillen’s epic landmark issue where all may be lost…and all hope may die! 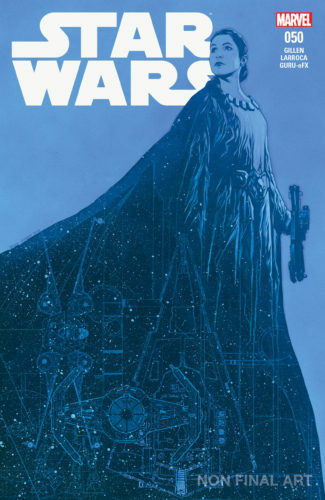 Since the comic’s launch in 2015, fans have followed the legendary journey of Luke Skywalker, Princess Leia, Han Solo, and more fan-favorite characters as the Rebellion pushed forward in their fight against the Galactic Empire. After taking over as the series writer in fall 2017, Gillen’s masterful storytelling is reaching new heights in this monumental next chapter. Packed with pages of action and intrigue, behold the beginning of the boldest high-stakes Star Wars story ever told – in stores this July!